Looking through my 2014 Japan archive, there’s a number of street photographs with bicycles. I think I’m attracted to bicycles, as a topic, because of the opportunity for motion blur, which adds dynamism to the image. 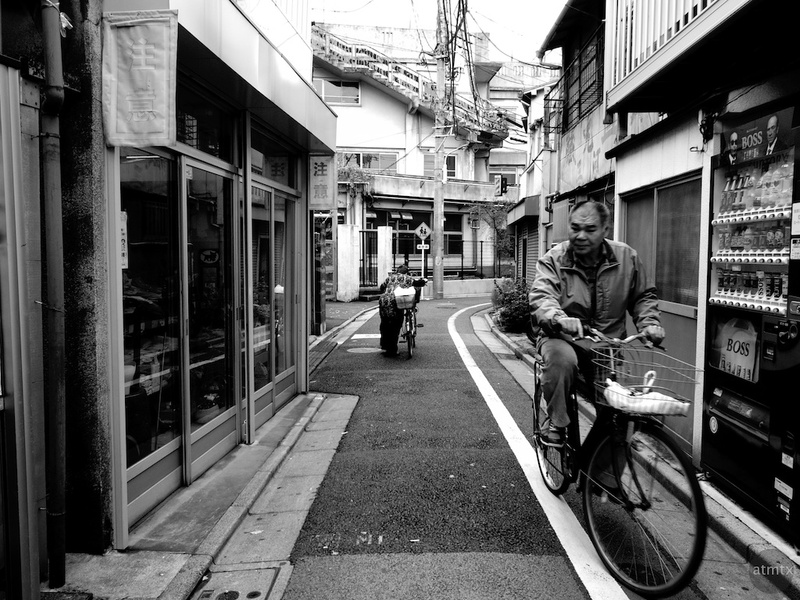 Here’s another bicycle photograph, but very different from my previous Japan post. This one doesn’t have much motion blur but I love the graphic, curved leading line. Plus, it has a nice details, from a typical Japanese neighborhood in Tokyo. Yes, much of Japan, and Tokyo in particular, is very dense. Small buildings packed together, which adds a nice urban texture. Many neighborhoods in the U.S. are too spread out to create a critical mass of visual interest. This photo, shot outside of course, functions like an interior photograph, with a defined floor and walls on both sides. If fact, this street is probably narrower than many rooms in America. Shot with my Pentax Q7 and a wide-angle lens with a in-camera black and white. Part of the Deep Blacks collection. Your Q-7 b&w shots are wonderfully crisp. Thank you, Marilyn. Give the in-camera black and white a try and let me know what you think.